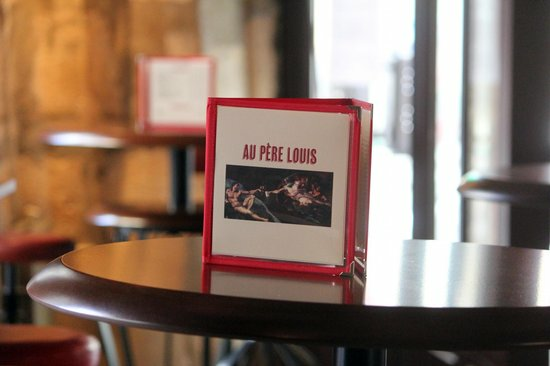 Located between the Odéon metro station and the Luxembourg Gardens, twominutes away from the famous Sorbonne University, in the heart of the 6tharrondissement, AU PÈRE LOUIS is an original wine bar & restaurant whereyou will experiment French gastronomy. Have a drink at the bar with your friends andshare a plate of delicious French charcuterie and cheese and a bottle or aglass of our impressive wine list, including Grands Crus. For a typical French dinner come to enjoy ourbeef ribs, our home made Cassoulet or our duck filet, which is even famous inNotre-Dame !! Our home made French fries will finish to convince you why youpicked the right place and also, why they are duly called French fries !!!!!!!! Our Bar and Restaurant is opened from 12pm to3.30pm and from 6pm to 1.30am,7 days a week.